5.Decide if you need Smoke Sensor,Gas sensor,Wireless Flash Siren to beef up your alarm system. 7.IF you have problem of installtion after reading user manual,it is better to ask for help rather than a faulty installation. your alarm system should be armed and ready to alert you at all time. 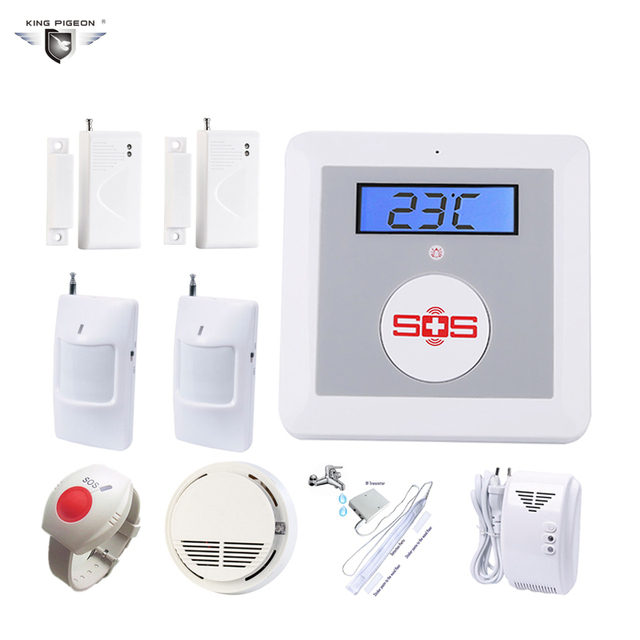 The K4 GSM Alarm and SOS Call equips LCD, supports temperature high/low alert, it is not only an alarm system,but also a senior telecare system. When it used as a GSM Alarm system, the user can call in to Arm/Stay operation with a free charge from its phone. and plus different wireless detectors to protect its assets. When it used as the senior telecare system, it can be used as a GSM Emergency call system, and also can dial and send SMS to preset numbers while Fall Down, Push SOS Button, Hasn't got up bed in time, carbon monoxide leak, or intrusion. Applications: For indoor use. Kitchen, Coal mine, Corridor, Office, Room, Museum, Library, Finance Room, Warehouse, etc. For indoor use. Corridor, Office, Room, Museum, Library, Finance Room, Warehouse, etc.